This is my first post, and I hope it has impact. Recently, a painting was discovered in a French attic. Lost for 400 odd years. Caravaggio (a known swordsman and brawler,) has been named the painter of said piece. There are concerns, however, with a multi-million price-tag at stake. After seeing a photo of the work, I found a few things to unsettle. One is the blade. This forum has the best arms and armour historians in the world, so I am calling upon your collective expertise to speculate if the image is valid without prejudice. The sword, like Man, is both vile and magnificent. Also the "gaze," looking at the camera or viewer was only popular in portraits, not in scenarios. 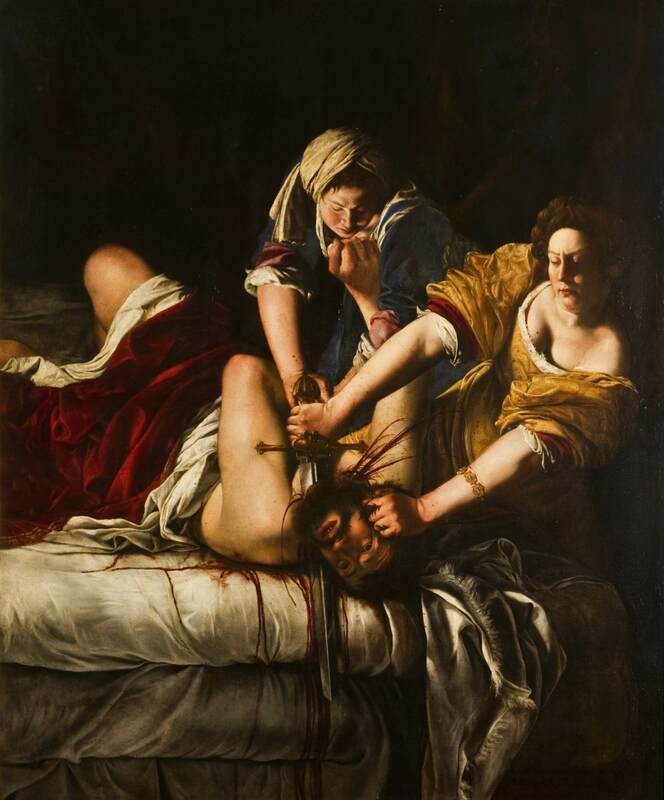 Well, the sword kind of sorta maybe resembles the one used by Artemisia Gentileschi's Judith , although her's terminates differently, and the hilt furniture appears to be different, it certainly could have been a model for a possible forger of this "Caravaggio", as both artists were roughly contemporaneous. You make an interesting point about the figure directly gazing at the viewer. Which one? She painted at least three takes on the theme and they all feature somewhat different swords... All three, however, are richly decorated civilian short swords very much of her day. Stylistically, this one is more in line with the simpler sidearm shown in Caravaggio's previously known painting on the same theme. 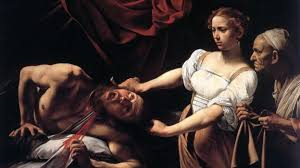 If we're looking for a source of inspiration for the assumed forger, I don't think we need to look any further than Caravaggio himself. We also have no context for this newly discovered painting - for all we know, it could have been commissioned as a... how to put this... fictional portrait of the woman cast as Judith, hence her looking through the fourth wall. Or it could be a fake! Too early, too little data to say. The point about the theatrical confrontation of the viewer with the subject;s gaze is an interesting one, resembles in some ways his paintings of various youths as Bacchus, John the Baptist and so forth, but those all feature a single figure. It will be interesting to see the results of further study on this piece. The Toothpuller also shows this gaze in a scenario. Some doubt it as a Carravagio, but this old art history student thinks it is, for what its worth. 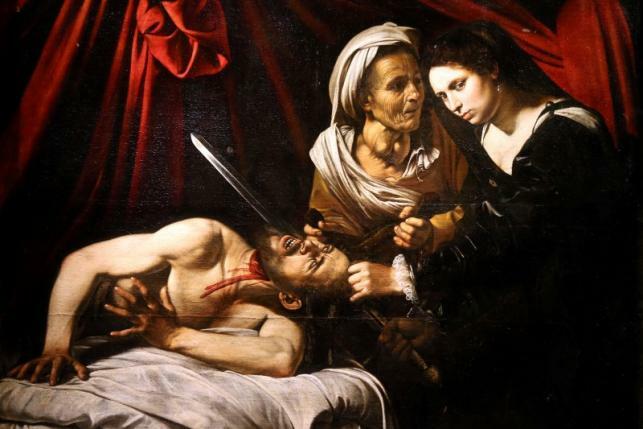 Yes, the new painting could be a forgery and I welcome a TON of scientific sleuthing to nail down the facts, but it looks like a Caravaggio to me. That's totally unscientific, of course, and a gut reaction, but its how it looks to me. Now, back to that nice red blend. If it was a Carravagio, it would have to be one of his earliest, it's so bad. Holofernes is downright cartoony. It's quite a contrast with the other example. It almost looks to me as though Holofernes was painted by another hand than that which painted the women.